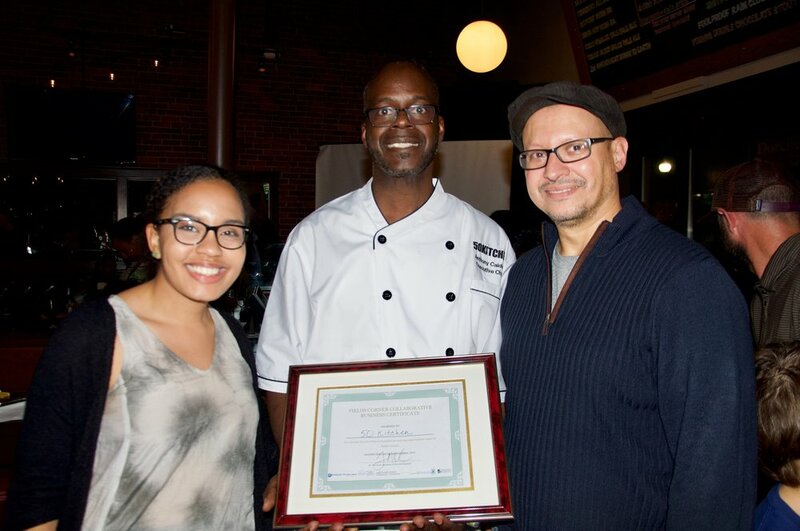 LEAF would like to congratulate Chef Anthony Caldwell of 50Kitchen for winning the Fields Corner Collaborative’s business development competition! To watch our interview with Anthony, click here! LEAF has spent the past year providing technical assistance to diverse small businesses in Greater Boston, including many food businesses operating out of the CommonWealth Kitchen, such as 50Kitchen. 50Kitchen is a catering service that provides clients with a colorful dining experience that specializes in healthy food that is “simple, flavorful, but with a twist.” Anthony takes simple food items, like sliders, and presents a colorful, unique version of the classic. Anthony named his business after a personal goal he set for himself to open up his own restaurant before the age of fifty. He is currently 49 years old. LEAF has been working with Chef Anthony to expand his business, and in September 2017, Anthony and the LEAF team began the journey of making 50Kitchen a serious contender for the Fields Corner Pilot Project. This competition was sponsored by the Fields Corner Collaborative (FCC)—a collaborative of small businesses in the Dorchester neighborhood of Boston. The goal of the pilot project is to give a promising small business the opportunity to move into a new retail space on Dorchester Avenue of the Fields Corner district of Dorchester. In preparation for the competition, LEAF worked intensively with Anthony to adapt his business plan to the Fields Corner retail space. This adaptation included new sales budgets, operating benchmarks, and financial projections. While working with Anthony, LEAF realized that Anthony had a story to tell that went beyond starting a business. His is a story that has been shaped by challenges not uncommon to persons of color living in Dorchester during the eighties and nineties, and that showcases the results of perseverance and focus. LEAF worked with Anthony to build a project proposal—and eventually a pitch presentation—that reflected his passion and verve for cooking, his entrepreneurial spirit, and his desire to give back to the community that shaped him. With LEAF beside him every step of the way providing business development insight and coaching, Anthony advanced through multiple rounds of interviews that whittled down the more than forty total applicants to a final count of four. It was with great delight that Anthony told LEAF that he had been announced as a finalist. In the last stage of the competition, the finalists were tasked with presenting their business plans to the Fields Corner community at a pitch event to be held at The Blarney Stone on November 2nd. LEAF and Anthony worked together on developing and fine-tuning Anthony’s pitch during the weeks leading up to the pitch event. On the day of the event Anthony gave an impassioned presentation on his dream of opening a sit-down eatery with a kitchen equipped for catering to serve healthy and high-quality “beautiful food for beautiful people” in Dorchester. Three other compelling presentations were made by competitors, including a bike co-op, an artist’s space, and another restaurant. Once each of the four finalists gave their respective business pitches, the votes of both audience members and the judges representing the FCC were tallied. Anthony was announced as the winner.